The Republic of Turkey was proclaimed on October 29, 1923. 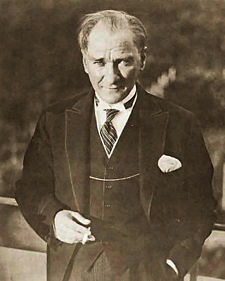 As its first President, Mustafa Kemal Atatürk (photo below) sought to establish the modern Turkey as a “vital, free, independent, and lay republic in full membership of the circle of civilized states.” He recognized the need for “public culture,” which would enable citizens to participate fully in public life, and saw the unification and modernization of education as the key. Accordingly, one of his first acts was to invite John Dewey, who arrived in Turkey just nine months after the proclamation. In this endeavor, the ideas of Atatürk and Dewey were consonant. Dewey’s words above (“vital, free, …”) could have been written by Atatürk, just as Dewey might have talked about “public culture.” Both recognized the need to institute compulsory primary education for both girls and boys, to promote literacy, to establish libraries and translate foreign literature into Turkish, and to connect formal schooling, the workplace, and government. Today is John Dewey’s 149th birthday. Back in 1924, he was nearing the age of 65, when many people think of retiring. But his three-month-long study in Turkey was an ambitious project. He addressed issues of the overall educational program, the organization of the Ministry of Public Instruction, the training and treatment of teachers, the school system itself, health and hygiene, and school discipline. Within those broad topics, he studied and wrote about orphanages, libraries, museums, playgrounds, finances and land grants for education, and what we might call service learning or public engagement today. The great weakness of almost all schools, a weakness not confined in any sense to Turkey, is the separation of school studies from the actual life of children and the conditions and opportunities of the environment. The school comes to be isolated and what is done there does not seem to the pupils to have anything to do with the real life around them, but to form a separate and artificial world. While Turkey needs unity in its educational system, it must be remembered that there is a great difference between unity and uniformity, and that a mechanical system of uniformity may be harmful to real unity. The central Ministry should stand for unity, but against uniformity and in favor of diversity. Only by diversification of materials can schools be adapted to local conditions and needs and the interest of different localities be enlisted. Unity is primarily an intellectual matter, rather than an administrative and clerical one. It is to be attained by so equipping and staffing the central Ministry of Public Instruction that it will be the inspiration and leader, rather than dictator, of education in Turkey. This was realized in many ways. For example, the central ministry should require nature study, so that all children have the opportunity to learn about and from their natural environment, but it should insist upon diversity in the topics, materials, and methods. Those would be adapted to local conditions, so that those in a coastal village might study fish and fishing while those in an urban center or a cotton-raising area would study their own particular conditions. Many of Dewey’s ideas were implemented and can be seen in Turkey today, as we come upon its 85th birthday next week. What’s even more striking to me is how relevant they are to the US today. Many of our problems can be traced to the “separation of school studies from the actual life of children and the conditions and opportunities of the environment,” but also to the separation of work from learning, of health from community, of libraries from literacy development, or of universities from the public. Dewey would be the first to argue that we need to re-create solutions in new contexts, but his report from long ago and far away still provides insights for a way forward today. This entry was posted in Cape Cod and tagged community, culture, economy, education, history, library, literacy, philosophy, politics, Turkey. Bookmark the permalink. ← Which side of the road do they drive on? for burden free education close school system. open as much libreary,playgrounds,laborateries,musiams,free of charge wandering fascilities to satisfy inquary\quary of one’s mind etc, i.e. all types of tools where one can find their answer and area of intrest and through this system he/she would be able in perticular field to serve a nation and same time will get his bred and butter easily.in this method children as well as parents remain tention free and will enjoy their time on there own way. As someone who currently teaches in Turkey, my question is where did it all go so wrong?! What we have now sounds absolutely nothing like what Dewey was suggesting. It is a completely artificial world dominated by tests that are focused on the rote memorization of “facts”, and grades are the only thing that the kids care about because that is all their parents care about. Entrance to university is determined primarily by a three-hour long, multiple-choice exam, and almost every kid goes to a cram school in preparation for the exam, so whatever genuine learning that could go on at school is dismissed in favor of the exam preparation. I may be exaggerating a bit, but not much. Those are great examples of connecting school with actual life. One middle school in Portland, Oregon (and possibly others) includes in it’s science curriculum a long-term partnership with a park and wildlife preserve that is within walking distance. Sixth grade students learn to identify and count species of animal and plant life and help with an annual clean-up of invasive species. Seventh grade students do these activities and additionally work in greenhouses to start seedlings of native plants. As eighth graders, students are guided in planting the seedlings that they nurtured the previous spring. The long-term project permits students to see effects of their work over time and connects them to “the environment,” not just as an abstract cause but as something that they experience on a day-to-day basis. And the school still meets science standards handed down by the district. In addition to curriculum-based activities, students who attend the school are expected to complete a certain number of hours involved in a “passion project.” This could be a soccer club or music lessons, but many students choose to volunteer time in a community organization. One student I know felt that “it wasn’t fair that some people should be hungry” and decided to spend afternoons working for a Meals on Wheels program that provides delivery of one meal a day to the elderly or others with mobility issues. She has also expressed interest in a volunteering at the Oregon Food Bank when old enough. I suppose the next step would be to ask why the student thinks people are struggling with food insecurity at all in this country. Our family just feels fortunate to be part of a school where community involvement doesn’t mean selling magazine subscriptions or candy.